CaliberDog Military style MOLLE Patrol Harness was designed to be a light weight working dog harness that will accommodate many of the MOLLE accessories and the GoPro camera mounts. This harness can be used with either the GoPro Top Back or Front Chest mounts. Each side of the MOLLE patrol harness has two rows of military spec MOLLE webbing to attach many of the MOLLE accessories we offer. The MOLLE accessories will not be rubbing on the dogs ribs because there is a layer of lining under the MOLLE straps. In addition to the MOLLE straps there is Velcro on top, both sides and the chest of this MOLLE Patrol Harness. You can attach any of the Velcro patches or ID panels to this harness. The front chest strap and the girth straps are adjustable so this harness can fit securely on the dog. On top of the harness there is a two inch thick metal welded D-ring. This ring is large enough that you can get two fingers into it or use multiple lines on the harness. We have designed the harness with a large D-ring rather than a V-ring because the rounded shape of the D-ring won’t jab into the dogs back. The handle is located on the top back front area of the harness so that you will be close to the dog’s neck when using the handle. This will give you more control when handling the dog. A nice feature of this handle is that it Velcro’s down flat on the top of the harness when not in use. This eliminates the problem of the handle hanging off the harness and grabbing the dog’s hair when you go to use the handle. The girth strap buckle is a load bearing metal Alpine Cobra buckle. Made in the USA. I'm purchasing my second harness, I purchased the first in Sept. of 2014. 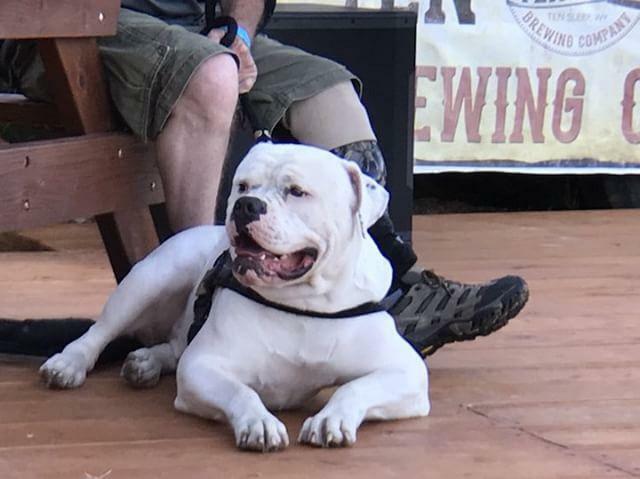 I have an American Bulldog, a service dog, I'm an amputee. This harness is fantastic, very well constructed and although I've had to restitch it a time or two (Augustus is a tank), it works perfect for my needs! I bought this harness for my two year old GSD. He's search and rescue and I was hoping to use it for tracking. It is extremely stiff but fit well. After using it a few days for tracking I found it was rubbing the hair on his back, causing the longer hair to break off. I fear if I continue to use it, it would cause a sore. It's a nice harness but not for my guy. Just be aware and watch closely after using it to make sure it isn't rubbing. I also bought the molle cape harness. It is softer and seems to wear better for my dog. I really like it.